Apple iPhone will be arriving in China by the end of 2009. iPhone’s arrival may not bring the myriad benefits of noodles and gun powder, back to the West, but will most certainly increase iPhone sales and substantially expand the reach of the App Store. As the ink of the deal begins to dry, it looks like Apple signed with the second largest carrier, China Unicom, and agreed to a custom opening screen with the cheery greeting, “Dear user, you are welcome to use the China Unicom’s business.” Mao would be proud. The size of the Chinese mobile market is estimated to be about 700 million users. Every 1% gained in that market is 7 million iPhones sold. Apple is estimated to have about 2% of the world market in mobile sales. If Apple could match that number in China that would be about 14 million iPhones. Considering Apple has sold about 25 million iPhones in 2 years in 80 countries, that would be a phenomenal increase in its worldwide market share. Like the wake behind a cargo ship pulling into Yangshan port, so goes the iPhone App Store. Once Apple has anything anywhere in a market, more will follow: laptops, iPods, iTunes and more. Just imagine a hybrid of the Trojan horse and a Mexican pinata. The rule, being second or being a fraction in the Chinese market, is that nothing is small. The other rule is that nothing is easy for all gold rushes are fraught with peril and potential. The first white water that Apple must negotiate is the Chinese law that does not allow the legal use of WiFi. To avoid this ship wrecking obstacle, Apple has removed the WiFi feature from the Chinese version of the iPhone. Why does China not allow WiFi officially, although unauthorized WiFi hotspots flourish throughout the country? Putting the ability on a mobile device that is likely to be very popular is just a little too far for the Chinese, at this point. China has also been attempting to get their own wireless standard accepted by international standards bodies, such as the IEEE, with little success. WAPI, also known as WLAN Authentication and Privacy Infrastructure, a wireless standard intended to ride on top of WiFi. Its compatibility with the security protocal of 802.11 was in question. This subject is a story in itself, for more about this issue, read, “A New WAPI – WIFI Standards War Looms” and “ISO Says “No” to WAPI, China is Not Amused, and Intel is “Mute”” at ConsortiumInfo.org. It is my feeling, no matter how stiff backed the Chinese government may appear on the standard of WiFi and their insistence on their own WAPI standard, that they are essentialy a pragmatic people and will eventually, quietly forego this effort. The Chinese were sophisticated traders when most of the rest of the world was still grubbing around in the Dark Ages. Fiercely competitive, yes, but they will accept what they, on their own terms, works best for them. Being part of a worldwide technical standard makes too much sense. The next stone in the stream looms large and is macro economic and geopolitical in scale. The United States and many European countries believe that China’s intention to have its own wireless standard is as much about trade as it is about censorship and citizen surveillance. As there are only 7 companies who would use the standard, all Chinese, the US sees this as an unfair trade barrier for its own mobile device manufactures. The WTO battle in which the United States was semi triumphant but China is now appealing, ruled that China cannot force US copyright holders to exclusively engage only Chinese government controlled distribution companies. The situation put companies outside of China at a disadvantage in competitive cost and exposed underlying technology to potential industrial espionage and possible piracy. This decision has sent a round of applause up from the content creatives, as well as, software designers, but the ruling could possibly be overturned. How will these issues affect the Apple iPhone’s grand entrance to China? At present, it seems to be very little, both sides have struck a deal they can live with. Apple has to build a unique iPhone for the Chinese version of CDMA at any rate, the iOS and the apps can live on top of the hardware. For those app developers building apps with WiFi capabilities will need to rethink business models and resubmit designs. The bottom line for Apple is getting the iPhone into as wide a market as is possible without incurring the wrath of the Chinese government and not exceeding the sensitive pocket books of the typical Chinese citizen. The challenges for app developers will be more in the landscape of dealing with Apple acceptance policies and the culturally unique needs of the Chinese mobile user. 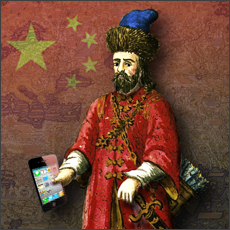 However it plays out, the potential of the mobile market in China cannot be ignored.